Oh, Russell Road. Back when Adam Ant was at it, us cool kids from the computer studies O-level class had a tour of Russell House, then home of Eastern Electricity. We were there to regard the blatterers and expungers, or whatever the proper terms are for the machines which spit out bills. School trips were great, and that one must have sown the utility seeds for my future brilliant career. On the former site of Russell House stands Endeavour House, futuristic home of Suffolk County Council. Standing directly opposite like a poor relation is Grafton House, functional home of Ipswich Borough Council. Underneath IBC are various units: there's a Premier Foods, the print unit and, as of May 2013, a coffee shop named Cool Beanz. They must be doing something right 'cos they're still here six months down the line. I'm hoping that the Xpresso mobile coffee cart is still doing business over there outside Staples too. Unlike our last outing to Baker & Barista, I'm first there, oh yeah. Lots of space, loads of tables, much squishy seating round the back plus papers and mags (Glamour, Red, OK): looking good. Turning away from Steve Bruce's fizzog on the wall-mounted telly, I survey the menu of tempting signature sandwiches and paninis. Cold today, though, so jacket spud, please, with the last of their chicken korma, and some blood orange juice. Andy's arrival coincides with my food, all of us gathering at the picnic table in the window. Good spud and served with a smile. At the neighbouring table is talk of "spinal points", clearly IBC internal business. Reminds me of overhearing judicial gossip in the Wolsey Theatre cafe a long time back. Some warming minestrone soup for him with his usual unusual milkshake accompaniment, this one apple pie flavoured. Oh-Kay. For dessert, he buys a double espresso and pours this in to the dairy remnants. He's a class act, that lad. Since we're running late -- we didn't meet until 2pm -- CB is beginning to shut up shop, bringing in the chairs from outside. Thankfully there's time for a chunky slab of ginger cake and a very good large flat white made with Paddy & Scott's coffee. They're big on local suppliers, which is nice. 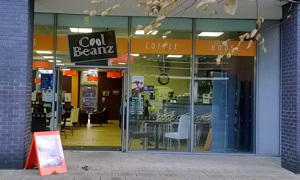 Well done, Cool Beanz, and may they one day host a school trip to see how a good independent coffee shop is run. If it was a car -- Hadfield Bean. If they were passing by -- Don Most.